Welcome to my blog! My name is Sue Hauser and I was thrilled when Michele asked me to be a guest blogger. 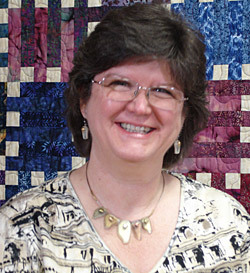 I am the owner of Alderwood Quilts, which is an internet quilt shop. I live in Oregon in the foothills of the coast range, where we have a small lavender farm in addition to the quilt shop. I have been sewing since I was 12 (more than a few years ago!). I had a wonderful home economics teacher named Mrs. Jones in 7th and 8th grade in Philadelphia who taught me how exciting it was to turn fabric into clothing. How many of you remember when we had Home Economics in school? In sewing class, we made gingham aprons and matching headbands and we embroidered our names on the headbands. Then we wore the aprons and headbands when we had cooking class. Now THERE’S a memory! I remember one fateful class when I was charged with measuring the salt and the sugar to put into the muffins. I carefully measured ¼ tsp sugar and a cup of salt and added them to the batter (instead of the other way around). I like to post recipes to my blog, and I promise they have the correct measurements for salt and sugar! From that point on, I started making most of my own clothes. (I caught onto sewing faster than I caught onto cooking). I made my wedding gown, and tailored suits for my husband. When the children came along, there wasn’t as much time for sewing and I drifted away from it. About 15 years ago, I discovered quilting and I’ve never looked back! I love old quilts. They hold a history that is rich and precious. 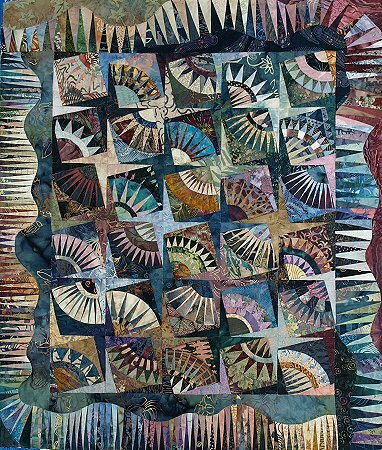 I also love contemporary quilts. They showcase the new fabrics, new techniques and new tools we have available to us. Not unlike a painting or a sculpture, a quilt comes from the heart of the artist, and it tells us a little bit about who she (or he) is. I love to look at a quilt and think about the quilter and how much of herself she put into it. I am so fortunate that I have met so many wonderful people through my business. Some of my customers have become friends. So many of them have shared stories of their quilts and I have posted many of the pictures they have sent me in a gallery on my website. I love to talk and share with people. When I discovered blogging, I felt like a kid in a candy store! Blogging is ALMOST as much fun as quilting! If you want to see what’s new on my website or read about sales, my newsletter is the place to look. My blog is where I chat about my quilts, pets, travel, recipes, and whatever comes to mind that day. I’m doing a different bag every month on my blog. These will be free patterns and you can sew (or knit) along with me each month. I do a give-away on my blog every month. The rule is that you just have to contact me and ask to be entered. You can reply to any post on my blog, send me an email or call me. For the month of February, I’m giving away a Jennifer Chiaverini book. There’s still time to put your name in – you have until midnight on Saturday, February 28th. For those of you reading this guest blog, I’m doing an extra special give-away! Anyone replying to this post will be entered in a random drawing for a pack of 7 fat quarters from Robert Kaufman’s Empress Bouquet collection. 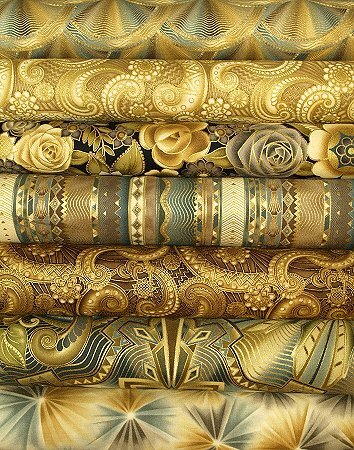 These fabrics are absolutely gorgeous! I just have to make something with them but I can’t decide what! Do you have any ideas for me? Reply to this post by midnight on March 6th and you’ll be in the drawing. Last month, my dog pulled the winning name out of the hat. I need to find a different way to do the drawing – the dog didn’t want to give me the paper. I’d like to share a few of my latest projects with you. Currently, I’m doing Yellow Brick Road with Mark Lipinski’s Califon. This fabric is just TOO much fun! Lately, I’ve been doing a lot of frayed edge appliqué. These quilts are addicting! I liked to cut out paper dolls as a girl. My grandmother used to pull out the Betsy McCall pages from her McCall’s Magazines and save them for me. When I went to visit her in the summers, she would have a whole pile of them for me. I used to spend hours sitting at her kitchen table cutting out new outfits for Betsy. (Please tell me some of you are old enough to remember Betsy McCall!). When my grandmother passed away, one of the things I kept were her little embroidery scissors. I’m sure it wasn’t great for the scissors that I used to cut paper dolls with them, but she never scolded me. I think of raw edge applique as grown up paper dolls. My latest is "Feeling Hoppy". Is he cute, or what!? I also love the Garden Cats series. They sew up quickly and they’re OOOOOh, so cute! Starting in mid-March, I will be doing the Garden Cats as a block of the month program. One of my favorite designers is Karen Stone. And my favorite quilt was made with Karen’s New York Beauty pattern. Karen’s pattern makes a very large quilt, but I reduced it by 50% and made mine a wall hanging. I have ordered several of her designs and will be adding them to my website as soon as they arrive. And the last project I’d like to show you is a Be Colourful pattern by Jacqueline de Jong. I’m going to take a deep breath and start this one soon. This stunning paper-pieced quilt is called "Circle of Life". 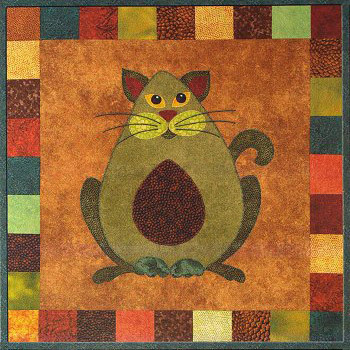 Jacqueline is a talented quilter from the Netherlands. She is also a very sweet lady. I met her at Quilt Market last year and saw her quilts in person. She quilts all of her quilts by hand! I asked her very politely if I could touch one of the quilts and get a better look at the hand stitching. She replied, "Of course! They’re only quilts!" Thank you for reading my guest blog post. And thank you, again, Michele! I have loved reading what all of the other guest bloggers have had to say. What a wonderful community of creative people! I think a jacket would be gorgeous out of these fabrics!! I did one with batiks and another with laurel burch fabrics using strips and squares and they turned out beautiful. 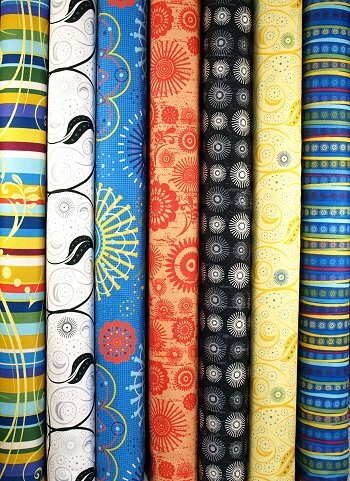 I have some of these fabrics and they are gorgeous. I would love to win some of them. Good luck with your project. OMG are those golds exquisite or whut? I can imagine a french braid using some of these with some other african prints that I have. Stunning. 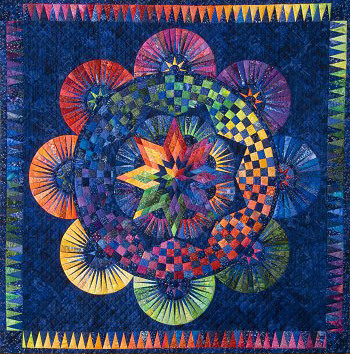 The Circle of Life quilt by de jong is breathtaking as are all of her quilts. I haven’t mustered up the confidence to try one of them yet. What beautiful fabrics…. the first thing that popped into my head were kaleidoscope quilts. you could make some really nice kaleidoscopes using those fabrics. I will be visiting your blog now that I’ve learned more about you. Thanks for a great post! Hi Sue – it’s so nice to read about you, I love these interviews. The fabric is beautiful, I think evening bags for my daughters, Mom and sister would be perfect, next Christmas would be taken care of!! I just had to say hello. Those are absolutely gorgeous fabrics. I already know what I want to do with them!!! Any of them with black! So dramatic….even if a traditional pattern. Love, love, love them all. Love doing raw edge fabric painting……construction……assemblage…..never quite sure what to call it. Come from the world of watercolor painting. Would love and enjoy the fat quarter collection. It is yummy! Your Feeling Hoppy is so cute. 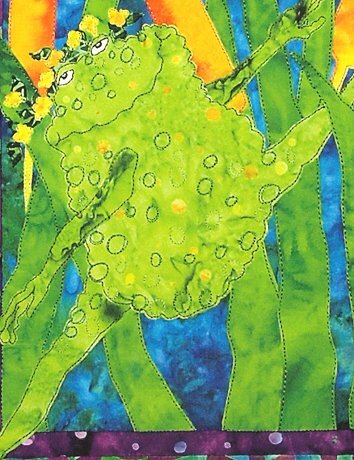 I love to make raw edge applique postcards. They are fast and fun to share. Thanks for posting. Those fabrics would make lovely evening bags. oh yeah! great fun and super quality information. thank you! I enjoyed your memories of Betsy McCall, I remember her well. That collection of fabric would make a beautiful kimono quilt set in black. Thanks for the paper doll memories. Love the show and tell!! Be Happy is so cute! Love your NYB, too. Great post! Stunning fabrics! I’d love to have the problem of having to figure out what to make with them. Oh, my, those are absolutely gorgeous fabrics! My first thought would be a good-sized handbag would be wonderful with them! I plan to go to your website and blog after I finish this, and have a look at both. And, oh, by the way, I Live in the Portland area, and I am going to make plans to come to your quilt shop. The Circle of Life and New York Beauty are both absolutely gorgeous. Make sure to post a picture of the Circle of Life you create – we’d all love to see and drool over it. Thank you for sharing these beautiful quilts! I always love hearing/reading what other quilters have to say and who’s work they’re looking out for. It’s so great being part of the quilting community because everyone looks to each other for advice and inspiration without getting too protective of their own works. As to the fabrics, I’d make a few extra fancy quilted pillows with a small throw to match! I am Becky Peer’s sister from Pontiac, Michigan. I love all your great ideas and photos! I would make a frayed edge raggedy jacket with the fabrics. They are beautiful! I spend too much time looking at websites and pattern books instead of sewing! CONGRATULATIONS, LISA! (comment #10) I picked your name out of the hat. Send me an email to sue@alderwoodquilts.com with your mailing address and I’ll pop these yummy FQ’s in the mail to you. If I don’t hear back from you in a week, I’ll draw another name. Thank you all for posting comments on my guest blog. It was such a fun experience to be a guest blogger! I have another giveaway going on my blog- alderwoodquilts.blogspot.com. Hi, Debbie (comment #22)! Send me an email so I can write to you. JUST LOVE THAT FAT CAT! The color combination of the cat quilt looks very good!.. There are 6 cats in the series so far, and many more coming out. They are all WAY TOO CUTE!!! Stunning fabrics! I’d love to have the problem of having to figure out what to make with them…hat beautiful fabrics…. the first thing that popped into my head were kaleidoscope quilts. you could make some really nice kaleidoscopes using those fabrics. I will be visiting your blog now that I’ve learned more about you. Thanks for a great post! I’ve fallen in love and will be looking for those fabrics! I don’t know which pattern should be used, but to cut these fabrics into too tiny a piece would detract from their beauty. Something that would show the patterns off to their maximum would be my vote. I enjoyed you interview. It’s too bad the schools don’t have home economics class like they use to. I learned the basics of sewing and cooking during my junior high years. I feel very fortunate to have had those wonderful classes, even if I didn’t always appreciate it then.